It's hard to know what to expect from a free image editor. After all, if all was fair, we'd be getting Photoshop minus about $700 worth of features. But many free editors, MAGIX Photo Designer included, have great strengths that serve a niche, and make them invaluable: If they do what you need them to. Although Photo Designer's selection of preset art filters is very complete, they all seem to result in an uncannily similar effect. As a lover of Xara products, I was really excited to try out Magix Photo Designer 7, billed as the free version of Xara Photo & Graphic Designer ($89). But the products are so different they are barely recognizable as even half-sisters, and few of the features I love about Xara are in Photo Designer's gene pool. Photo Designer's red-eye reduction tool worked very well on the image I tested. 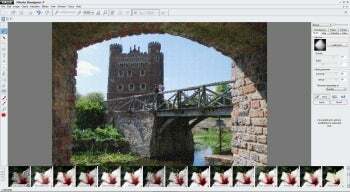 Unlike the step-up versions, Xara Photo & Graphic Designer 7 or Xara Designer Pro ($299), Photo Designer creates an iris-sized stamp that you use with one or two clicks to gray over the red-eye parts of your images. I found it to be just as effective as the gray dot you need to somewhat accurately draw using the more expensive versions--and it's certainly easier to get the hang of. I also preferred Photo Designer's Clone Tool over the Xara software. Photo Designer's version works more like Photoshop in that you chose the clone and then paint over the area you want to replace. It's simple and a lot more effective than the new Xara method. These were the only features of Photo Designer that really impressed me, however. Like other Xara photo editors (and high-end products like $700 Adobe Photoshop), Photo Designer has the tools to select groups of pixels and make changes specifically to the selection. The tool is an exciting addition, but its effectiveness depends greatly on the Photo Designer brush you have selected, and there's not much in the way of help: Rather, you're left to experiment. If your experimentation goes well, however, expect to be able to apply blur, fill, brightness, and color adjustments to selected pixels within your image. Photo Designer includes fewer features than GIMP (a free, open source image editor), which makes it less intimidating. And much like Serif's PhotoPlus X5 ($89), Photo Designer includes a Task Assistant, which takes you step-by-step through common tasks like creating panoramic images, isolating parts of your image, and optimizing colors. PhotoPlus X5's version is much more detailed, however, and although it's a nice feature in Photo Designer, it oftentimes left me wanting help with the next step. Photo Designer includes a number of interesting presets to turn your image into a painting, drawing, or other style of artwork. These filters worked relatively quickly, but not very well, and certainly nowhere near with the same finesse as FotoSketcher, a free tool that excels at turning images into fine art. I found myself adjusting the settings manually to differentiate Photo Designer's preset effects from one another. If you're looking for a free image editor to manipulate specific parts of your images---down to a pixel by pixel level of detail---or make quick changes, Photo Designer 7 may be a good fit for you. It's a little clunky and unpredictable, especially compared to sister product Xara Photo & Graphic Designer, but the ability to 'Shop images for free is worth the tradeoff. Add precision detail to your image editing with free Photo Designer 7.